Cooking with zucchini can sometimes be tricky. Luckily, this recipe has a few tricks that make this a fabulous zucchini plus egg dish. 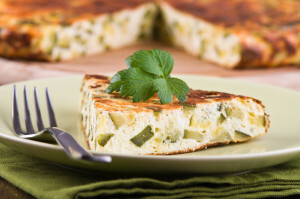 The Mozzarella, Feta and Parmesan add to the amazing flavor of this frittata dish. To prepare the zucchini – cut into fourths, lengthwise, and use a spoon to scrape out the center part and the seeds, leaving about ½ inch of flesh on the skin. Then cut each piece into large strips just over ½ inch wide and chop the strips into pieces just over ½ inch square. Heat the oil in a non-stick or cast iron skillet over medium heat. Add the zucchini pieces and season with the Italian seasoning and seasoning salt, salt and pepper, and cook turning often until zucchini is nicely browned on all sides, about 9 minutes. Reduce heat to low and sprinkle the cheeses over the zucchini and let it start to melt for a couple of minutes. Add the beaten eggs and stir gently with a rubber spatula. Cover the pan and cook on low until the frittata is barely firm but still slightly wet looking, about 15 minutes. While frittata is cooking turn on the broiler. Uncover the frittata and put the pan under the broiler for 2-3 minutes until lightly browned. Serve with sour cream if desired.